The developer has resumed work on Droylsden Canalside Quarter, following confirmation of a £1.3m loan from the Homes & Communities Agency’s Get Britain Building programme. There are 54 homes being developed in the £8m latest phase of the development and are now available to be reserved from plan. The residential units comprise of two and three bedroom houses for private sale. 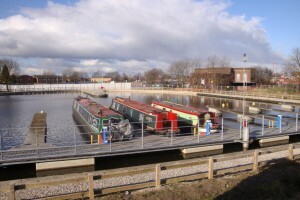 Tameside Council and Watkin Jones entered into a development agreement in 2006 for a major mixed-use development consisting of residential, marina off the Ashton canal, offices and retail. The scheme froze after the first phase of 69 residential units and the marina were completed in 2008. More recently, the Council and Watkin Jones have worked together to review how the development could be kick-started. This led to a new planning approval in October 2011 for a revised residential scheme focused on more family housing as opposed to the former apartment-led scheme. The £570m Get Britain Building programme is supporting house-builders by providing access to development finance to unlock up to 16,000 new homes across the country, protecting and creating thousands of jobs. The current phase of the work is expected to be completed early in 2014.